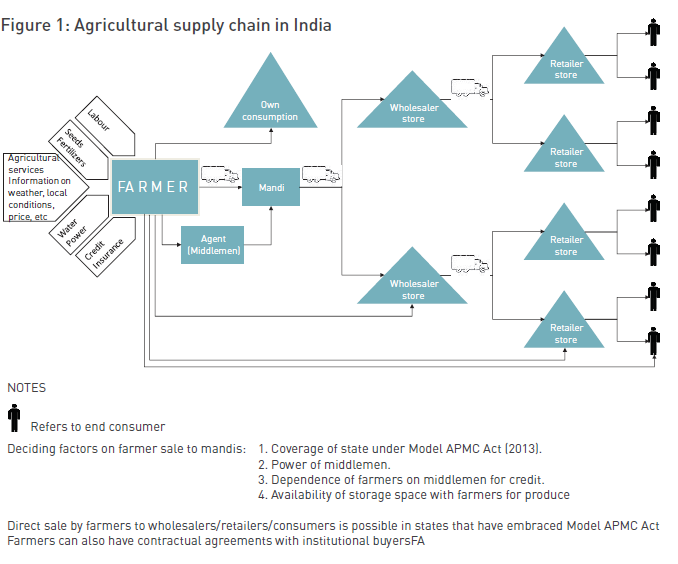 Lack of well-developed supply chain systems for alternative crops expose farmers to considerable risk, making it difficult for them to move away from the paddy/wheat crop rotation cycle. Public policy interventions and supply chain innovations such as targeted insurance products, pooling practices, investments in skill development, entrepreneurial models for service provision, market-side initiatives and a better understanding of supply chain risks are needed to enable farmers to adopt crop diversification. It is estimated that about 49% of the total workforce in India is engaged in agriculture, the single largest contributor to the distribution of economic activities in the country. Most households that are engaged in agriculture have limited alternative livelihood strategies. While 63.4% of agricultural households have cultivation as their primary source of income, as reported by the situation assessment survey of agricultural households, India, 2013 (NSSO, 2013), the sustenance of such households, depends heavily on the success of the crops that they grow. Changing climatic conditions pose a serious threat to agriculture by increasing the risk of crop failures. Models that link yields of the four largest commodity crops to weather indicate that global maize and wheat production declined by 3.8% and 5.5%, respectively, relative to a counter-factual without climate trends (Lobell et al, 2011). With greater climate variability, shifting temperature and precipitation patterns, and other global change components, farmers are increasingly being subjected to crop failures, which not only affects their livelihoods but also negatively impacts the food production for the country (Brenda, 2011). It is proven that crop diversification is a successful strategy to improve the resilience of agro ecosystem. Resilience is defined as the propensity of a system to retain its organisational structure and productivity following a perturbation. Thus a resilient agro ecosystem will bounce back to its normal state after a negative shock caused by adverse environmental conditions, such as drought, lack of rainfall, rise in temperature, etc. Biodiversity—which allows the coexistence of multiple species, fulfilling similar functions, but with different responses to human landscape modifi cation—enhances the resilience of ecosystems. A diversified crop portfolio adds to the biodiversity, thereby improving the resilience of the agro ecosystem (Brenda, 2011). Changing climatic conditions pose a serious threat to agriculture by increasing the risk of crop failures. Models that link yields of the four largest commodity crops to weather indicate that global maize and wheat production declined by 3.8% and 5.5%, respectively, relative to a counter-factual without climate trends (Lobell et al, 2011). 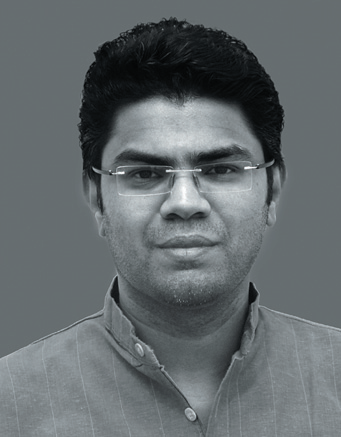 Agricultural policy in India is not conducive to crop diversification, often leading to obstacles. Farmers in different parts of the country are often caught up in the rotation cycle of few regular crops, for example paddy/wheat rotation in Punjab & Haryana, Paddy rotation in East Godavari, etc. Government has installed large-scale procurement mechanisms for paddy and wheat, by way of forward contracts that cover costs under all circumstances. As Table1 indicates, 50% of total paddy and wheat procurement by Government comes from Punjab and Haryana. As we have already seen, by diversifying their crop portfolio to add alternative crops, farmers can improve the resilience of their agricultural production system, and significantly reduce their exposure to adverse effects of changing environmental conditions. In addition to this reduced exposure, crop diversification also offers other benefits. A recent study has shown that by adding horticultural crops such as cauliflower, tomato, onion and capsicum to their agricultural portfolio, farmers in Punjab, who otherwise rely only on paddy/wheat rotation, can increase their farm-level income by 30%, and also decrease the use of water by 29-50% (Chhatre et al, 2016). While crop diversification has distinct advantages such as reduced exposure to climatic changes and increased expected revenue, the lack of a robust supply chain system for alternative crops poses many uncertainties and challenges. Chhatre et al. (2016) discuss in detail the challenges arising from lack of well-established supply chain for alternative crops. Paddy/wheat rotation is largely protected from the above uncertainties and challenges, because of many reasons. The labour requirement for these crops is low and predictable. The availability of migrant labour during peak demand period assures a steady supply of labour. The green revolution, followed by efforts from government machineries to provide technical support for growing high yield varieties of paddy and wheat, has ensured availability of quality seeds and appropriate fertilisers for farmers. Credit and insurance instruments for paddy and wheat are well established. Subsidised power has enabled farmers to invest in irrigation machinery for paddy and wheat. Moreover, as mentioned earlier, government procurement mechanisms for paddy and wheat, by way of forward contracts with farmers, cover significant market risk for these regular crops. To incentivise farmers to adopt alternative portfolio of crops, it is important that policy makers understand the associated risks and design mitigation strategies. We focus on four key factors that contribute to the uncertainty, and discuss how the lack of well developed supply chain systems for alternative crops contributes to the uncertainty. The green revolution, followed by efforts from government machineries to provide technical support for growing high yield varieties of paddy and wheat, has ensured availability of quality seeds and appropriate fertilisers for farmers. Credit and insurance instruments for paddy and wheat are well-established. Thanks to the established procurement mechanisms by government, paddy and wheat have a stable price support, with low volatility across time and markets. However, the alternative crops are subjected to high price volatility, as understood from Figure 2. Paddy and wheat being cereals can be stored for long periods of time without major infrastructure requirements. However, vegetable crops which are perishable in nature need cold storage and transportation facilities. Lack of such facilities force the farmers to sell these crops immediately after harvest, with prices falling deeply thereafter. 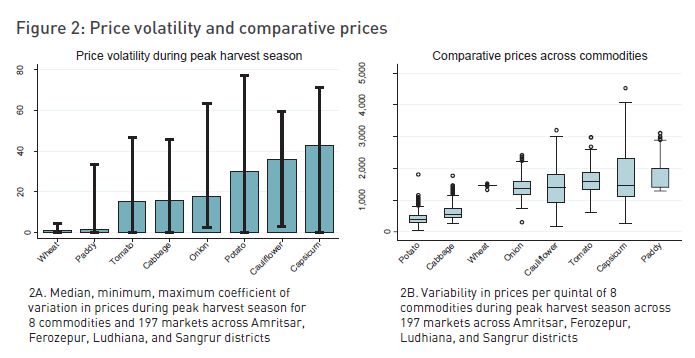 Such price fluctuations contribute to the volatility of alternative crops, and farmers are often unable to get remunerative prices for their crops (Maheshwar and Chanakwa, 2006). Alternative crops are more labour intensive, and require more skilled labour than regular crops such as paddy and wheat. The seasonality of labour demand for paddy and wheat are well known, and the additional demand during transplantation is met with large-scale labour migration from states such as Bihar and Jharkhand. However, for alternative crops, the demand for labour is higher and in addition the extra labour requires specific training and specialised skills in handling delicate and perishable products. This class of labour is currently not available in the required quantities in the country. Working capital requirement of paddy and wheat is low, and subsidised credit is easily available to the farmers. However, alternative crops require significantly high working capital and credit instruments are not well established for these crops. Lack of scale in the number of farmers growing such crops causes difficulty in addressing this problem. Moreover, the cost of capital for such crops is high due to uncertainties associated with price volatility, labour availability, etc. Over and above the yield risk the alternative crops that are perishable in nature also need cold storage and transportation facilities post their harvest. Lack of such facilities lead to high degree of wastage of such crops. According to some estimates 30% of fruits and vegetables grown in India are wasted due to lack of well developed farm-to-fork supply chains for these products (Maheshwar and Chanakwa, 2006). Yield risk is an inherent part of agriculture. Thanks to the long-standing and established nature of paddy and wheat cultivation, the investment and focus on agricultural research pertaining to these crops have been very significant. This in turn has led to the development of high yield and pest-resistant varieties of crop. Research has also led to development of advanced farming technique for such crops. However, the alternative crops are devoid of such focus on research, and hence pose high yield risk. Over and above the yield risk the alternative crops that are perishable in nature also need cold storage and transportation facilities post their harvest. Lack of such facilities lead to high degree of wastage of such crops. According to some estimates 30% of fruits and vegetables grown in India are wasted due to lack of well-developed farm-tofork supply chains for these products (Maheshwar and Chanakwa, 2006). 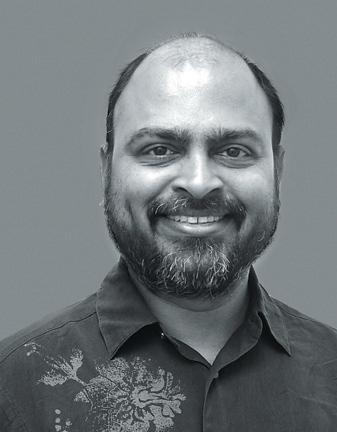 Insurance products designed for specific risks: Crop insurance in India is currently a nascent economic sector, whose popularity is hampered by several design and implementation fl aws. Policy makers could focus on encouraging private sector initiatives targeted at specific risks and crops. Pooling practices: Economies of scale can be achieved through pooling practices such as land pooling, labour pooling, pooling of output, collective bargaining agreements, cooperative arrangements for storage, etc. Public policies designed to promote and support such pooling efforts can enable farmers to adopt a portfolio of alternative crops. Investments in skill development: Lack of skilled labour forms a major obstacle to crop diversifi cation by farmers. The current national programme on skill development also needs to focus suitably on agricultural sector. In addition, investments are also required on the farm mechanisation of high-value vegetable crops, so that skills and technology are adequately matched. Entrepreneurial models for service provision: It is possible to develop an ecosystem of services necessary for agricultural productivity through entrepreneurial models. For example, the efficiency and cost at farm level depend heavily on the right application of inputs such as seeds, fertilisers, pesticides, etc. Currently, these input decisions are taken by the respective farmers, whose skill levels vary significantly between each other. This in turn results in sub-optimal resource management, affecting cost and efficiency. However, if there was a service enabled and supported through public policies which could contract for application of inputs for a fi xed cost, farmers would be liberated from performing these tasks. Market-side initiatives: A focused effort on increasing the demand for the alternative portfolio of crops is important. In addition to domestic customers, the market for alternative crops can include buyers in developed countries. This can help improve the returns for smallholders. Serving these markets necessitates investment in supply chain practices required to meet stringent quality and traceability requirements. Public-private partnerships (PPP) and multi-national companies (MNC) can play a key role in developing farmto- fork linkages. MNCs can work with farmers directly, and help them access better quality inputs and adopt better farming techniques. This practice can be mutually beneficial – farmers can realise higher yields and income by growing alternative crops, and MNCs can develop a reliable supply source of high-quality agricultural products. Understand supply chain risk: It is necessary to understand the supply chain risk associated with inputs, production, distribution, storage and sales for each crop separately. Many other countries have made investments in this direction, and these learnings could be transferred where applicable to India. Most farmers in India rely solely on agricultural income, which heavily depends on the success of the crops that they grow. Climatic changes pose a serious threat to the crop success. Crop diversification, which includes growing an alternative portfolio of crops other than the regular paddy/wheat rotations, helps reduce the exposure of agro ecosystem to environmental changes by improving resilience. However, the lack of a well developed supply chain for alternative crops exposes farmers to considerable risk, making it difficult to move away from the paddy/wheat crop rotation cycle. Public policy interventions and supply chain innovations such as targeted insurance products, pooling practices, investments in skill development, entrepreneurial models for service provision, market-side initiatives and understanding supply chain risks can address these risks and enable farmers to adopt crop diversification. Brenkert, Antoinette L., and Elizabeth L. Malone. “Modeling vulnerability and resilience to climate change: a case study of India and Indian states.”Climatic Change 72.1-2 (2005): 57-102. Chhatre, Ashwini, SripadDevalkar, and Sridhar Seshadri. “Crop diversification and risk management in Indian agriculture.” Decision 43.2 (2016): 167-179. Maheshwar, C., and T. S. Chanakwa. “Postharvest losses due to gaps in cold chain in India-a solution.” IV International Conference on Managing Quality in Chains-The Integrated View on Fruits and Vegetables Quality 712. 2006. Lin, Brenda B. “Resilience in agriculture through crop diversification: adaptive management for environmental change.” BioScience 61.3 (2011): 183-193. Lobell, David B., Wolfram Schlenker, and Justin Costa-Roberts. “Climate trends and global crop production since 1980.” Science 333.6042 (2011): 616-620. 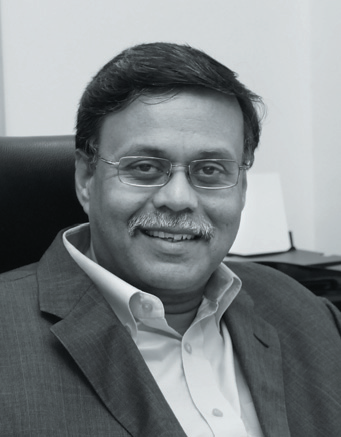 Professor of Operations Management, Senior Advisor to Dean for Research; Area Leader-Operations Management; Academic Director-Advanced Statistics and Computing Lab. Research Associate with Munjal Institute for Global Manufacturing at the Indian School of Business (ISB). Assistant Professor of Operations Management, ISB.